In today’s competitive marketplace, companies often take extensive measures to attract new business and pique the interest of potential clients while maintaining the ones they currently have. Use of social media marketing, digital ads as well as traditional television and newspaper ads can all be very effective in growing your company, but it may not always get noticed. Feeling unappreciated is the number one reason customers turn away from products and services. To garner brand loyalty, research shows that clients want to feel like they matter—and the statistics don’t lie. 66% of consumers switch brands because of poor service. In other words, those companies failed to go the extra mile to make their customers feel special. So if you want to stand out from the crowd, it’s critical to give clients the VIP treatment your competitors won’t. How might you do this, you ask? The solution can be quite simple. If your company wants to deliver a personal touch to clients that shows appreciation while getting important messages across, consider using a Hallmark card. Think about it. 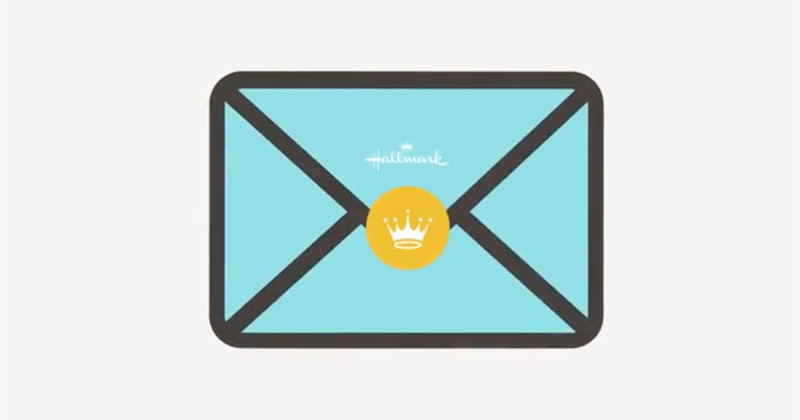 When was the last time you didn’t open a Hallmark card? If you ask our clients who send them to their customers, they’ll tell you Hallmark cards get their messages open, read, understood and acted upon better than other direct mail formats. Below we’ve included some examples demonstrating how. View all three case studies in the video below, or read our quick overview of each one for more information. A specialty retailer wanted to beat their 4% response rate and drive a higher ROI. We custom designed a Hallmark card that fit their brand, included a message of appreciation and showed their special offer. Customers also received coordinated emails reminding them of the offer. Response rates rocketed to 22% in online and in-store sales. For every dollar spent on Hallmark cards, the campaign generated $38.00. Read the full case study here. A utility company wanted to enhance their customer experience with an impactful solution that could be tracked and measured, and give frontline associates a positive way to connect with customers. By empowering their employees to quickly pick, personalize and send Hallmark cards, they now get calls from happy customers sharing how appreciated they feel. The company went on to increase their customer satisfaction scores by 25 percentage points. Read the full case study here. When we created an automated Hallmark birthday card and eCard program for a financial service provider to foster loyalty and keep their product on the minds of customers, the buzz spread on social media. And the program consistently delivers a 7% to 10% increase in transactions. 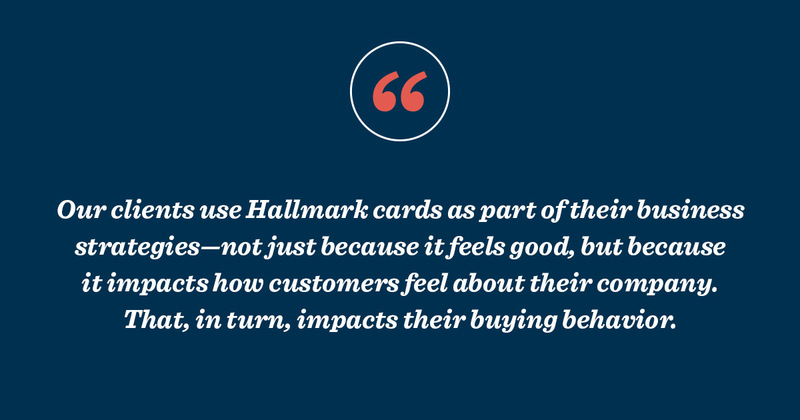 Our clients use Hallmark cards as part of their business strategies—not just because it feels good, but because it impacts how customers feel about their company. That, in turn, impacts their buying behavior. Let us put the power of Hallmark cards to work for you. Find out how we can help your business effectively reach and maintain a strong customer base by clicking here.